As the end-of-the-year holiday approach, we often get questions about opportunities for volunteering. And an event this week might be able to point you in the right direction. The event will include live entertainment and fine art, the food of some of the finest area chefs, and fuel for inspiration as volunteer agencies from around the city are on hand to explain their work and needs. Ignite is an initiative of Christ's Church Albany, in partnership with our many community partners. Ignite attendees will have the opportunity to choose from more than fifteen agencies and dozens of projects with ease - on the spot. It has never been easier to Serve Albany! Here's the list of participating non-profits. 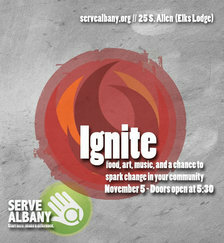 Ignite is Wednesday, November 5 at the Albany Elks Lodge (25 South Allen Street in Albany). Doors open at 5:30 pm. It's free.